Are Barefoot Running Shoes Hype? I finally bought myself a pair of barefoot running shoes yesterday after thinking about it for literally about 2 years! So what took me so long? It’s not like this is such a big decision after all. Paula Jager, the Fitness Editor for this blog, wrote a post not too long ago about barefoot running and the benefits of shoes designed to mimic how we walk and run naturally. Worst of all, they are designed to make you land with your heel while we are designed (by nature) to land on our forefoot. The repetitive strain of slamming on your heel results in undue shock and potential joint injury. By landing on the ball or forefoot with light steps allows our arch to act like the natural spring that it is. By wearing all that fake support our muscles, tendons and ligaments have weakened. And that’s not only the ones found in our feet but also in our hips and legs. This will also decrease coordination, agility and balance. Well said Paula! I find the reasons for barefoot running to be rather compelling too which is why I’ve been considering these new types of shoes for quite sometime. 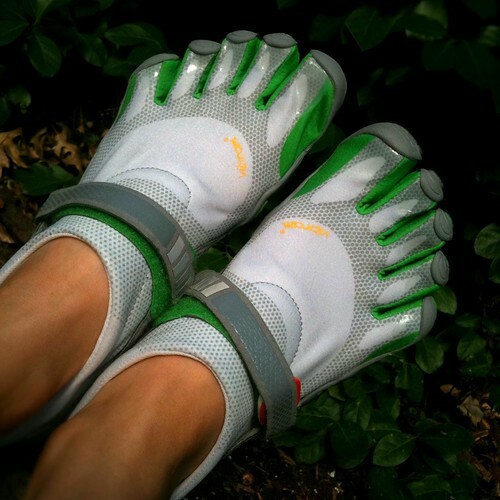 My holdup with getting my first pair of barefoot runners was actually my husband who doesn’t at all like the look of the Vibrams Five Fingers models which were some of the first barefoot runners on the market. “They look really weird” he would say whenever I brought up the possibility of buying a pair for myself. I figured the problem was just that it was a new fashion trend and he would eventually get used to it, so I just waited. No chance. After all my waiting, he still hated the look of those shoes and so did all 3 of my kids! “Don’t get those Mom, they look like frog feet” my boys would tell me. As luck would have it, something else happened in recent months to change the deal in my favor. Barefoot runners were introduced to the market that look more like a regular sneaker. Hurray! When these new barefoot runners first came out, I was ready to bite, but they were a bit too expensive for my taste. I can’t justify spending $100+ for a pair of sneakers when it comes right down to it. It just seemed excessive to me. But yesterday, I found a pair that were an excellent price and they were snazzy and cute looking to boot. So I snapped them up as we have a bunch of outdoor hiking type of activities coming up this summer and I need a really good pair of shoes anyway as my sneakers are pretty beat. My question to all of you is, are these shoes really worth it? Did I succumb to marketing hype by buying a pair or will I be nothing but thrilled in the coming weeks as I wear them for my outdoor excursions? Please chime in as I would really like to get your opinion. And, if you think my new sneaks are ugly (or cute), feel free to mention that too!